We sell, ship and install engines and transmissions nationwide and have been doing it for over 84 years. We have the largest variety of in-stock remanufactured transmissions in Texas. We carry domestic transmissions as well as Japanese and European imported transmissions. If we do not have your transmission in stock, we can remanufacture yours and return the transmission to you fast. Thunderbolt didn’t become Houston’s #1 transmission repair shop by luck. We have been committed to providing the best quality work, at honest prices, with integrity since our inception. A car’s transmission is an integral part of what makes a vehicle run and it is important to understand the warning signs (see below) that can point to transmission trouble. If you would like more information about Thunderbolt transmission repair, please Contact Us Today! Thunderbolt Engines and Transmission offers local transmission repair Houston area. We also offer nationwide shipping for all Thunderbolt products and parts. If we don’t already have the part in stock that you’re looking for, our team can manufacture or acquisition it for you. We’ll go the extra mile for all of customers so that you get complete satisfaction. Thank you for choosing Thunderbolt! At Thunderbolt we fix it right and we guarantee it too! Although some may think this smell is a sweet sign of a successful fast drive…it is most likely not that at all. When there are problems with a car’s transmission, the fluid can leak and burn. Definitely do not ignore a burning smell when you are driving around. Catching transmission problems early can help save you a great deal of hassle, stress and money. Contact us for your transmission repair Houston! If you are hearing transmission sounds when your car is in neutral, what you are hearing is a message for help. By not ignoring this problem you may find the fix is as easy as adding transmission fluid. Be sure to consult your vehicle owner’s manual before purchasing transmission fluid to make sure you are getting exactly what you need. One of the clearest signs of transmission problem is leaking fluid. If transmission fluid is leaking you need to bring it to our transmission repair Houston shop right away. Often times a leaky transmission will trigger the check engine light, in addition the car may begin shaking when driven. If you are wondering about transmission problems, please bring your car or truck to us right away. 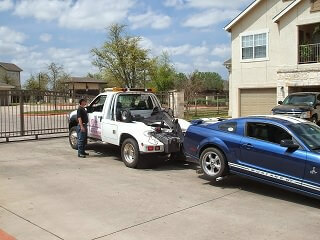 Our mechanics are prepared to give you an accurate quote and provide the best service available in Houston. If you have any concerns about the condition of your transmission we’re here to help. Tbolt is the leader in transmission repair Houston TX. We’ll give you an honest answer if there could be anything wrong with your transmission that may need transmission repair. If any of the above symptoms appear to be getting worse, then don’t hesitate to ask the Houston area transmission professionals. We’ve been working with all makes and models of vehicle transmissions for over 84 years. Our experience is just what you need to maintain a healthy engine. Save yourself any headaches down the line and let Tbolt make sure that you’re in perfect running order.